It’s Friday, and if you follow Damian Lillard on Twitter, you’re well aware it’s time for #4BarFriday, Lillard’s Instagram-based rap showcase. It’s not quite Freestyle Friday on 106 & Park yet, but at least when it’s bad, you can take solace in it only lasting 15 seconds. With yesterday’s announcement that Lillard has been named an All-Star reserve, it’s safe to assume the Trail Blazers guard will have some victory bars ready for us. But the most important tangentially sports-related news in Portland doesn’t come from Portland at all. Atlanta rappers Young Thug and Bloody Jay released the curiously titled Black Portland mixtape last week. 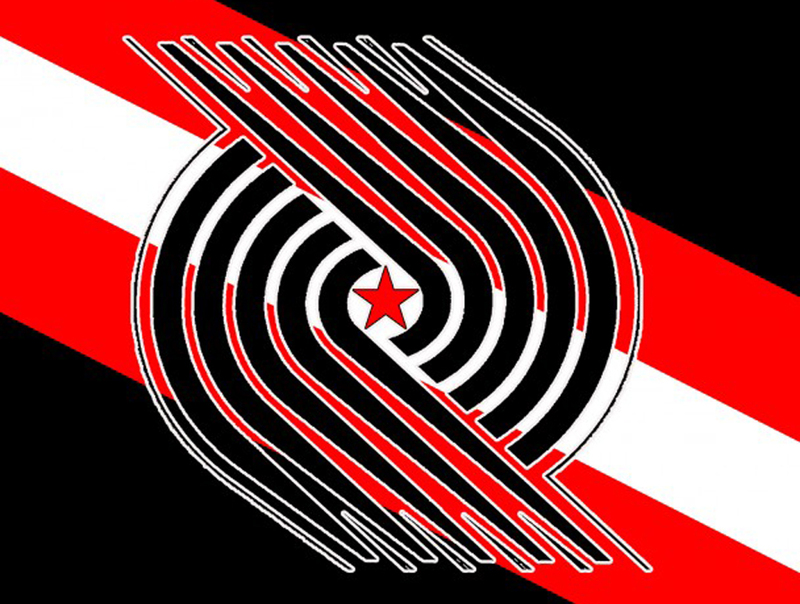 The mixtape includes a rough approximation of the Trail Blazers logo as the cover art, Antawn Jamison and R.L. Stine references, and the song “Danny Glover,” one of Young Thug’s previously released tracks that has made considerable noise in the last few months. Kanye West knows the song by heart and rapped along at a Paris club; Donald Glover commanded his legion of Twitter followers to make Bill Cosby dance compilations with it as the soundtrack, and Nicki Minaj recently put out a remix that features the best use of “pico de gallo” since carne asada fries. The Fader’s Naomi Zeichner did the Lord’s work and got to the bottom of the title choice earlier this week, but a question still remained: Have any of the Portland Trail Blazers players heard the mixtape? I had a chat with Damian Lillard over the phone yesterday to talk #4BarFriday, rap, and the answer to that all-important question. Did #4BarFriday start as a creative outlet for you to get your voice out there? It started as something I was interested in. I rap in my spare time a lot of the time, so once Instagram made the 15-second video, I just put it together. You could say four bars in that amount of time, and I wanted to start something like that on a social network. It came together perfectly. I’ve listened to your bars, and they’re really similar to your game — it’s got that calm, poised air to it. It moves at a tempo that works with what you’re trying to do. Rap and basketball are extensions of you in that way. Yeah. I mean, everything that I say is something that I experienced. It’s who I am as a person. Same goes for me as a basketball player, with the emotions — it’s just the story behind who I am. Of the NBA players who submitted their four bars, who do you think had the best? Not counting yourself, of course. Paul George can spit. Iman Shumpert can spit. Stephen Jackson is cool, too. You were a big Juvenile guy growing up. Did you see the video of LeBron and Michael Beasley performing “Back That Azz Up” at their karaoke event? Do you think they did the song justice? I did see it, I did see it. I mean, it was cool, but they had to block out some of the words because Juvenile uses a lot of profanity, but it was pretty good. I don’t think there were enough people onstage to do the song justice. [Juvenile] had a deep group, but you know, with what they had, they did cool. I probably wouldn’t have performed that song if I had to do a Juvenile song. What song would you have done? Who’s the guy in the locker room that is always sharing new music? I would probably say either Mo [Williams] or T-Rob — Thomas Robinson. Just whatever’s most recent. You know, we’re up on Yo Gotti, some of Yo Gotti’s stuff. Me and T-Rob always talk about Rich Homie Quan. You’ve tweeted Rich Homie Quan lyrics and you picked Migos’s “Hannah Montana” as the team’s warmup music sometime last month, so I know you guys are listening to that Atlanta rap right now. Yeah, they’re putting out some good stuff. I like music you can dance to, vibe to, a little bit, and I think that’s what’s hot right now. Especially the people coming up with all these dance hits, just finding something that’ll stick to a large group of people. I think all those songs are big hits for that. I don’t know if you caught the Rose Bowl or not, but it was kind of amazing seeing Rich Homie Quan celebrating with the Michigan State team in the locker room after their win. I mean, I saw the pictures. I don’t know why he was there. I don’t either. The entire locker room busted out singing “Type of Way” in unison. It was great. Just throwing this out hypothetically, and I’m knocking on wood right now, but if you guys went all the way and could get an artist to come celebrate with you, who would you pick? What would be the song you shout along with him in the locker room? Probably “We Made It.” [Laughs.] If it wasn’t that, it’d probably be “Worst Behavior.” That’s been hot around the team. You’ve probably been asked about this during the week, but have you or any of your teammates listened to the Black Portland mixtape? I haven’t. I saw a bunch of stuff about it on Twitter, so I was going to check it out eventually, but I haven’t heard any of it yet. They called their tape Black Portland because they felt a connection to this current Blazers team. How does it feel to be the inspiration for their movement? It shows that people are seeing what we’re doing, and people respect it. You know, it’s bigger than basketball. They saw us being a young group that’s coming together as a team and just getting it done. That goes for a lot of different groups, and you can do whatever you want — with a team, and just having goals and stuff like that, and bringing it all together and going after it as a group. The fact that they’re inspired by that, as artists, based on what’s in basketball — that lets us know we’re doing something right.